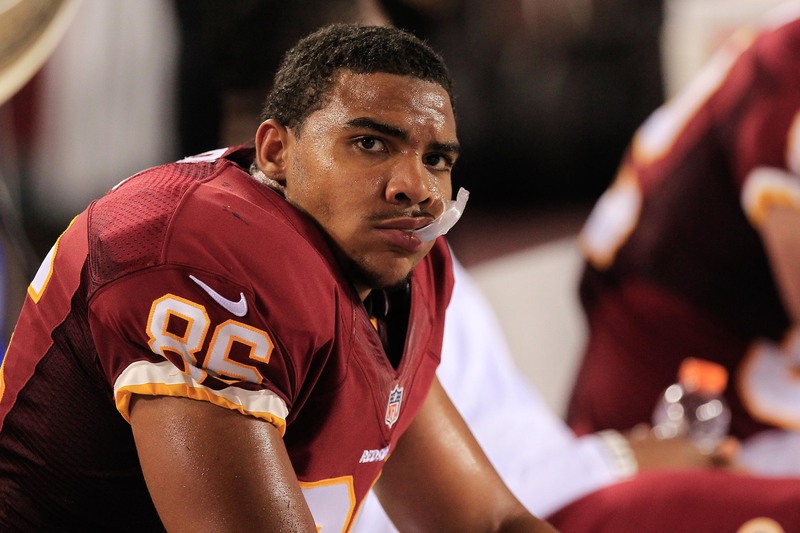 Jordan Reed has been a revelation as a Redskins rookie. It’s happened again, nine weeks in and the Washington Redskins are in exactly the same position as last year, a 3-6 record and a season that is to all intents and purposes as dead as Richie Incognito being on Jonathan Martin’s Christmas card list. The 2013 Redskins running game is firing on all cylinders, with some memorable three-touchdown games from two members of the backfield not named Alfred Morris, and despite a reservation at the start of the season to tuck and run Robert Griffin III has had a number of statistically great games in his second NFL season. The offensive line has again been an under-appreciated but over-achieving unit led by Pro Bowl left tackle Trent Williams. The biggest addition since 2012 to the offensive weaponry at RG3’s disposal has been rookie 3rd round selection, tight end Jordan Reed who came from the Florida Gators. Expected to learn his craft under veteran Fred Davis, who was re-signed in the off-season on a one-year deal, Reed has been snapping away to the tune of 44 catches for 487 yards. It would be a somewhat tough ask, but Reed could gain 1000 yards as a rookie, which would be up there with the achievement of Alfred Morris rushing for over 1600 yards as a rookie in 2012. Unfortunately the Redskins defense has looked better on paper than it has on the field, getting terrorised to the tune of 388 yards a game and 31.9 points a contest, with only the lowly 0-8 Jacksonville Jaguars yielding more points a game (33). This was a team that somehow managed to send three of its linebackers to the Pro Bowl earlier this year, somewhat ironic when the team’s weakness has been tackling. The teams two star outside linebackers Brian Orakpo, back from an injury filled 2012, and Ryan Kerrigan who has been the Redskins only real source of sacks (6.5 so far in 2013), have flashed their talent but have not shone, and 38-year-old London Fletcher is inevitably slowing down. Fletcher had a tough time growing up and was always an outside shot at even making an NFL roster, but he has been an absolute rock in the Washington locker room and on the gridiron, but expecting him to shoulder the defense for much longer is not a viable option. Washington’s secondary has been the biggest weakness, giving up big play after big play. Putting in two rookies David Amerson and Baccari Rambo has been one of the major reasons that teams have been confident to air it out. Rambo has looked more like Dumbo sometimes, and whilst Amerson has picked off two passes (including one for a touchdown) teams are picking on the new guys. Like chewing gum on the sole of your flip-flops a few career backups have again stuck around to cover for injuries and dips in form. Both safety Reed Doughty and defensive tackle Kenrick Goldston have been living on the periphery of the Redskins roster for many years but they simply are too valuable to release. If anything these are guys that personify what it is to be a player in the NFL. Not the most talented, rarely on highlights packages, but always ready to step in and sacrifice their body’s for the greater good. The kicking game has been anonymous in 2013 and the return game has been poor. The Redskins miss having a true return talent and have to rely on backup tight-end Niles Paul to return kicks and plodding wide-receiver Josh Morgan to return punts. Last season the Redskins were 3-6 and I wouldn’t have bet a single penny that the team would tear off seven consecutive wins en-route to a divisional title and a home playoff game. Now in the same position with seven games left the Redskins are remarkably still in the hunt for a division title. 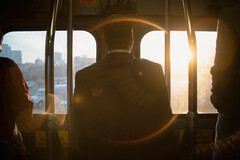 The Dallas Cowboys top the division at present with 5 wins but the NFC East truly is the NFC least and it is not beyond the realm of possibility that an 8-8 record plus a tiebreaker situation that even Russel Crowe’s beautiful mind could not solve could see the Redskins again punch their ticket to hitch a ride on the post-season express train. It’s more likely they will bump into Tom Hanks on the Polar Express but if you would have asked me if the playoffs were achievable 12 months ago I would have laughed in your face. As I write Alfred Morris is leading the NFL in rushing and RG3 is on target to throw for 4355 yards. Wide receiver Pierre Garcon has been living up to his potential at last, and wideout Leonard Hankerson is even starting to show up, but 29 catches in 9 games is not going to turn you into a household name. This would equate to an 8-8 record, which I think unfortunately will not be enough to win the division. Despite an emotional Week 16 victory I have a bad feeling that a Cowboys win over the Eagles in Week 17 will put Dallas at 9-7, enough to scrape a division title. I say all this because my predicting skills are not exactly on a parallel with Nostradamus. It’s going to be another wild ride, lets hope the burgundy and gold train stays on the track until Christmas, what a present that would make for Redskins fans around the world. Right now I am calm as it hasn’t really sunk in. I keep saying it in my head but the words don’t seem real. The Redskins win on Sunday Night, they win the NFC East and get their ticket stamped into the playoffs. Not the fantasy playoffs or the latest Madden season I’m playing, but the real NFL playoffs, the ones where you play real games beyond the statutory sixteen. I was trying to explain this to our one year old daughter as my wife washed her in the bath this evening. It was then our daughter Gabriella cleared her throat and stood up naked in the bath, frantically grabbing sponge letters she had as a present from Father Christmas just yesterday. We both sat back in awe as she slapped the letters onto the bath tiles – one by one spelling out a phrase. Please see what she wrote and if you are a Redskins fan please post this link everywhere you can. Ross Tucker may talk a lot of nonsense in his ESPN Football Today podcast, but I happen to strongly agree with one of his sentiments this week that there is no such thing as a ‘mild’ concussion. You either have a concussion or you don’t. The Redskins star rookie quarterback Robert Griffin III suffered an alleged ‘mild’ concussion last week in a tough loss to the Atlanta Falcons. It was well documented that he could not recall the score or the quarter he was in the second time that trainers asked him to give some straight forward responses. So what are the Redskins likely to do this weekend against the rabid Minnesota Vikings? Rest their franchise for a week and make sure any spiders are gone and not still forming cobwebs in his cranium or just bow to fan pressure and the need to get back to a .500 record by starting him for the sixth week in a row? Looks like the Redskins are going to bring back RG3 seven days after he couldn’t tell if he was on the opening drive or performing a two-minute drill. Big big mistake if they do decide to bring him back, and to compound this sense of doom RG3 will be restricted from his natural style of play where he uses his feet to move the chains, along with his arm. Fellow Redskins rookie passer Kirk Cousins had a real mixed bag in his first spell of NFL action, finding a wide open Santana Moss for a huge td, but also showed his misjudgment and lack of experience with two second half interceptions. No matter I would rather see Cousins trying his best than watching an RG3 who is thinking too hard, or maybe in some of the darker recesses not thinking at all whilst the cobwebs implanted by Sean Weatherspoon’s legal but lethal hit slowly disintegrate. Mike and Kyle Shanahan be sensible and give RG3 an important job on Sunday……………………official clip-board holder. This is without doubt the sexiest pair of Nike trainers I have ever seen. I have a battered pair of Black and White Air Max and they served me well, but boy would I love a pair of these babies. Had a terrific birthday today, thanks to my beautiful wife, who got me an awesome new camera, some nice aftershave and the Apocalypse Now box-set. I cant help being greedy though, as I still have one more birthday wish – free agent wide receiver Braylon Edwards becoming a Washington Redskins player. The Redskins have been active in free agency in the past week, but none of the names have been up there with previous movement (such as Bruce Smith, Deion Sanders, Albert Haynesworth etc). The players picked up have been solid but all unspectacular. CB Josh Wilson, NT Barry Cofield, WR Jabbar Gaffney, OG Chris Chester, P Sav Rocca, WR Donte Stallworth. Not much Pro Bowl potential there, but mostly all upgrades on what we had take to the field last season. 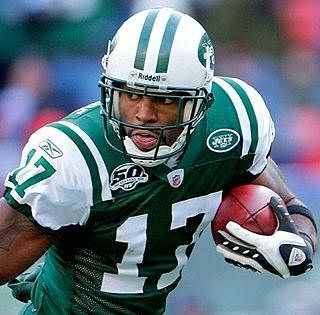 Despite signing two WR and re-signing Santana the smurf Moss we still miss a gamebreaker, someone who could bust open a hitch for 80 yards or catch a 50 yard bomb. The best FA WR was Santioni Holmes but he is now busy swigging champagne in the Big Apple. His running mate is the player we simply have to target. 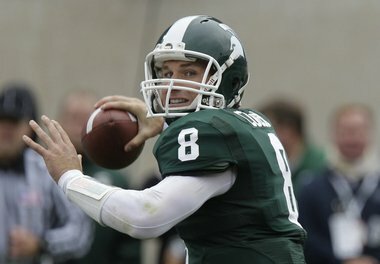 Providing Braylon cuts of that tramp beard (or doesn’t grow another) he could be a big fan favourite in D.C.
Come on Dan and Mike – its not like I’m asking for much – just spend about £30m on a 5 year deal for Braylon and my birthday will be even more superb than it already is. 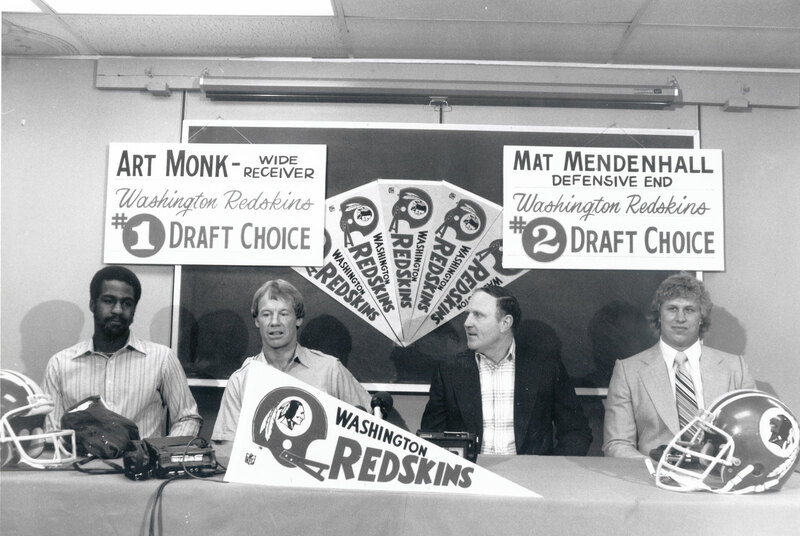 As possibly the world’s number one Art Monk fan I was delighted to see the picture the official Redskins blog writer Matt Terl found. From left to right in 1980 is Syracuse graduate Art Monk, Redskins GM Bobby Beathard (looking somewhat like Crocodile Dundee), Redskins coach Jack Pardee and his own portable comb-over, and Tommy Gunn from the awful Rocky V, oops I mean DE Mat Mendenhall (whooooooooo?????). Even as a rookie yet to suit up in the burgundy and gold Mr Monk looks a bit bored and uncomfortable under the limelight and would much prefer to be out on the practice field catching passes from Joe Theismann. I do love Monk’s style – a freshly ironed shirt but no tie, unlike Chewbacca on the right of the picture. You also have to love the pennants and the fact they were blu-tacked on the chalk board behind. Obviously there must have been a direct correlation between the mould developing in the far left ceiling tiles (check the picture again) in the training room and the Redskins lacklustre 6-10 record in 1980. Lets hope Dan Snyder has gone for a wooden ceiling in the film room today.